Our Boulder repiping company has been serving the Colorado area for over thirty years. We are a family owned galvanized re-pipe service in Denver and Boulder, our number one priority is your satisfaction. All of our Boulder repiping technicians are trained specially to ensure the highest quality work. We also take great care when working inside the home by wearing shoe covers and utilizing floor mats. Not only do we do indoor plumbing, we also perform full pipe line replacements. We are the repipe specialists in Boulder. We offer PEX repiping, galvanized pipe replacement in Boulder, copper repiping in Boulder. Customers choose to have us service their needs when they find their water goes cold too early, rust colored water is present, or when they’re tired of low water pressure. No job is too big or too small. When it comes to our Boulder repiping service and your plumbing needs, we do it all. We provide re-piping options that are personalized to ensure satisfaction. 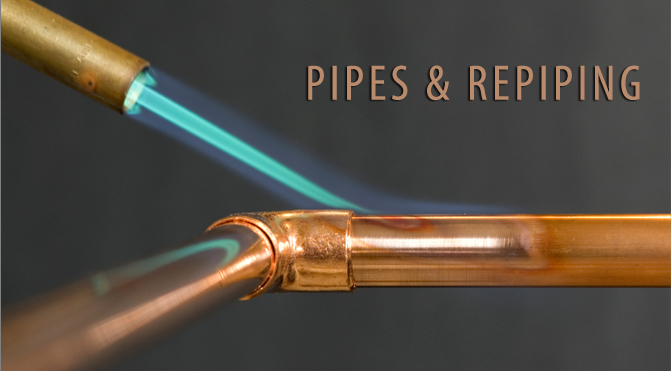 We provide Boulder with copper repiping plumbers that are trained to take care of our customer’s every need. Often times, clients call about having various issues with their water quality that can be addressed by PEX Repiping, galvanized pipe replacement in Boulder, or copper repiping in Boulder. Some common complaints include rust colored water or low water pressure. Rust colored water comes from older, sometimes corroded pipes and water mains. As the repipe specialists in Boulder, we can eliminate this unsightly problem. Low water pressure is an easily addressed common problem. older iron pipes can have a buildup of rust which often time plugs the aerator. In turn, this causes the water pressure to be uneven and slow. As the repipe specialists in Boulder, we can replace your clogged and built up pipes with very little turnaround time. Another problem that we address is the water goes cold earlier than what is expected. As a trusted leader among Boulder copper repiping plumbers, we can handle this task. We are an all-around plumbing company in the Boulder repiping and plumbing industry. Our plumbing company not only provides Boulder re-piping options, but we also have a one of a kind exceptional guarantee. We offer a true 100% satisfaction guarantee. We pride our self in providing our customers the best services, materials and value. So call our Boulder repiping team now and let us help you.